Non-search ways to find your files, emails, posts etc. - Datamaton Inc.
Part 4: this post – Non-search ways to find your content. Some of the methods described in this post help you quickly find content within a specific storage locations, while others work across all storage locations. There are many ways in which Blob helps you quickly locate whatever content you are looking for when you do remember the storage location where it resides. Select a storage location from the left pane of Blob and double-click on it to display its contents. 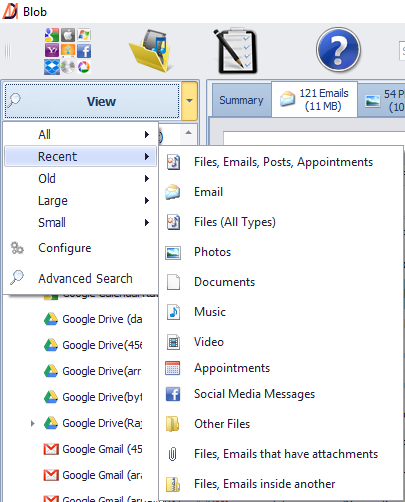 The left pane expands below to show the folders at that storage location. The right pane shows the emails, files etc. as separate tabs. At this point, you’re looking at all the content within that storage location, regardless of the folder it is in. You can sort and search for any content within that specific Data Source without having to remember the folder within which it resides. Blob shows photos, music files, videos, documents, emails, social media posts, contacts and appointments each in their own separate tab. This way, you can quickly go the “Docs” tab if you are looking for a document, or to the “Photos” tab if you are looking for a picture etc. Each tab that displays a specific content type has multiple columns – one for each property of that content. For example, the “Email” tab has columns for email sender, recipients, subject, date, size etc. You can click on the column header of any column to sort the display on that property. For example, you can click on the “Size” column to sort emails in decreasing sizes to quickly find an email that has a large video attachment. A small arrow next to the column name indicates how results are currently sorted. For example, the picture below shows results were sorted in decreasing order of “Last Modified” date. Therefore, you’ll see the newest content first in this results display. You can click on the column header text of any column to sort the results on that property. Click on the same column header again to change the order from “decreasing” to “increasing”. Within each tab, there’s a search text box that lets you find content within that specific tab. As you start typing into this box, Blob will only show content that contains the text you’ve typed in any property field. Thus typing “John” in an email tab will only show emails that contain “John” in the sender, receiver or subject fields. Blob will highlight the search text in the display. There’s a per-column “filter row” in each tab that displays content. This is the empty space just below the column header circled in red in the picture below. When you type something here, the display will only show content that contains this text in that column. Each column has it’s own filter space and capability. For example, you can type work in the file-name column and doc in the file-extension column. This will restrict the display to only show files whose name contains the text work and whose file extension contains the text doc. If you are trying to find content that matches one of these “View” options, you can click on the corresponding View Shortcut. This will report matching content across all your storage locations. Let’s say you are trying to find a recent email from someone but don’t remember the email account and folder where you put it. You can click on “View”, “Recent” and “Emails” to quickly look at all recent emails in all your email accounts. A Virtual Folder is essentially a saved search – to which you can also add other content. When you run a search, the results display window has buttons to save it as a Virtual Folder. If you find yourself running the same search repeatedly, you can just save it to a new Virtual Folder. When you double-click on it later, Blob will re-evaluate the rules embedded inside it.